Want to find out the latest news from Rotary? Here's a great opportunity to find out what's going on. 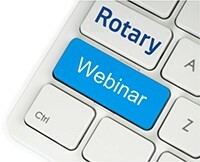 Your opportunity to ask about all things Rotary!! The event is designed for all Rotarians in Zones 24-31 and will include an update from your Zone Director Dean Rohrs and Trustee Bryn Styles. It is scheduled for Jan 10, 2017 4:00 pm PST To register click here for the registration site. After registering, you will receive a confirmation email containing information about joining the webinar.